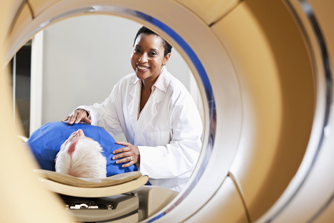 Diagnostic imaging is used to diagnose disorders and illness within the body. At the Margaretville Hospital Radiology Department, we have a number of tools at our disposal to help our patients, in both emergent and scheduled situations. Our latest procedure that we offer is Computer Tomography, with our new, highly detailed 16-slice CT Scanner. CT scanning is used for angiograms, guided biopsies and interventional procedures, and rapidly takes hundreds of X-ray images to create a 3D interior model of a patient’s body or organs. Also offered are bone density scanning, digital mammography, ultrasound and Doppler studies, and X-rays. For all of our diagnostic imaging, we use film-less Picture Archiving and Communication Systems, which gives our patients’ physician or specialist instant access to their diagnostic images. Call 845.586.2631 ext. 3245 to schedule bone densitometry, CT scans, digital mammography, ultrasound and X-rays. This test is the most widely used method of studying bone density, and is used to diagnose and track bone loss and osteoporosis. The U.S. Department of Health & Human Services recommends that all women over 65 are screened regularly for osteoperosis, as well as “at risk” women and men over 60 and 50, respectively. A CT Scan is a popular medical diagnostic test that rapidly takes hundreds of X-ray images from various angles to create a 3D interior model of a patient’s body or organs. At Margaretville Hospital, we have a new 16-slice CT scanner, which is used for angiograms, guided biopsies, and interventional procedures. Digital mammography is a form of X-ray technology that diagnoses abnormalities in breast tissue. The design of the machines ensures top image quality while minimizing the radiation dose, and can highlight areas that require additional testing. According to the American Cancer Society, only 8 to 10% of mammograms require a follow-up biopsy, 80% of which are found to benign. Ultrasound produces real-time images from inside the human body with high-frequency sound waves. Since there is no radiation involved, it is commonly used for obstetrical imaging, as well as for aorta, bladder, renal, thyroid, breast, scrotal, carotid, arms and legs, and pelvis imaging. X-rays pass through the body and produce diagnostic images that allow physicians to examine bone and soft tissue, and are primarily used to evaluate the skeleton, heart, and lungs. They have been reliably used in medicine for over 100 years, but we use modern updates like the Picture Archiving and Communication System for faster access, results, and diagnoses while improving the quality of your care.